Mr. George Burton, President of Canadore College, was appointed as Honorary Colonel (HCol) of 22 Wing North Bay, Ontario, in March 2016. 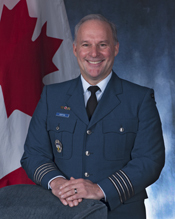 HCol Burton previously served as the Honorary Colonel for 21 Aerospace Control and Warning Squadron, North Bay. Honorary Colonel Burton was born in Deep River, Ontario and graduated from Canadore College with a diploma in Recreational Leadership before obtaining a Bachelor of Science degree from Lake Superior State College and Masters of Arts in Education from Central Michigan University. He is currently pursuing doctorate studies in Education. Honorary Colonel Burton began his career at Canadore College, North Bay holding a number of positions and continued in the post secondary sector at George Brown College, Toronto as Director of Management and Student Information Services and Registrar before branching into the private sector, first with Canada Trust Financial Services and then, from 1999 – 2005, as Executive Vice President of Telmar HMS Ltd. He returned to campus life at Loyalist College in Belleville, Ontario in a selection of posts including the Executive Director of Loyalist Training and Knowledge Centre, Vice President, Enrolment Management and Student Services and Vice President Academics before returning to North Bay in July 2010 to his current post as President and CEO of Canadore College. Honorary Colonel Burton serves as a member on a number of Boards including the Committee of Presidents, Contact North, North Bay and District Multicultural Centre, Innovation Initiatives Ontario North and Ontario Colleges Library Service, as well as being Director for the College Employer Council. He is also engaged with the Academic Health Sciences Network and the North Bay Regional Hospital. Honorary Colonel Burton and his family reside in the North Bay area.